Spring training preview: Relief pitchers. Today begins our daily countdown to pitchers and catchers reporting to Spring Training on Tuesday with a position-by-position breakdown of the Dodgers’ roster. We begin with the bullpen. I didn’t include Aaron Harang, Chris Capuano or Ted Lilly on this list, even though one or more of them could wind up pitching out of the ‘pen. Even without them, this is a solid unit on paper with ample depth. The closer situation is fairly clear, but the Dodgers enter the season with more viable options for the ninth inning than they’ve had in recent seasons. There are a few injury concerns facing this unit, but none are severe. With one exception, the Dodgers’ bullpen should start the season healthy, capable of becoming one of the best in the National League. A three-year, $22.5 million contract makes him the Dodgers’ closer to start spring training, but League’s hold on the job is not guaranteed. A midseason acquisition from the Seattle Mariners, League was 6-for-6 in save situations during a stellar September with the Dodgers, allowing just one inconsequential run to score all month. Over the season’s first five months, however, he was shaky (3.88 ERA, 25 walks in 55.2 innings). You might recall that Javy Guerra was the Dodgers’ closer for the final month of 2011, kept the job to start 2012, then was replaced by Kenley Jansen after blowing three saves. The same could happen if League falters. He is entering his ninth major-league season at age 30, but has only been a full-time closer in one of those seasons. As long as his sinkerball is sinking and staying around the mid-90s — as it was in September — League could be in line for 40 or more saves. Jansen lost the closer’s job to League not because of poor performance but because of a cardiac arrhythmia that necessitated surgery in October. The surgery caused a small interruption in Jansen’s off-season regimen but he should have a normal spring. While he was the closer, Jansen posted a team-high 25 saves and finished the season with a 2.35 ERA. Batters hit a collective .137 against his cut fastball, according to FanGraphs. So if he’s a younger, bigger Mariano Rivera, why should Jansen be relegated to set-up duties? That question isn’t likely to bother Jansen, who never complained about his ever-changing role last year. If anything, it gives the Dodgers a good stake in the new National League arms race: The Washington Nationals added former Yankees closer Rafael Soriano to go along with incumbent closers Drew Storen and Tyler Clippard, while the Braves and Reds are similarly stacked with late-game flamethrowers. Jansen gives the Dodgers a similar “eighth-inning closer”-type that the league’s best bullpens all seem to possess. Belisario recently had a crazy escapade in the Caribbean Leagues, part of a fairly uneventful winter in the world of the enigmatic right-hander. He came back from a drug suspension to go 8-1 in 2012 with a 2.54 ERA and 69 strikeouts in 71 innings. There’s no reason to believe Belisario can’t be filthy again. His sinker/slider combination relies more on movement than velocity (low 90s) to be effective, insulating him against the possible speed-sapping effects of turning 30. Belisario broke his habit of arriving late to spring training last year. This year he’ll leave early – he’s expected to close for Venezuela in the World Baseball Classic. The Dodgers will keep an eye on Belisario for possible fatigue, but with the added help around him this year he can probably pace himself over 50 to 60 games. Belisario’s numbers were better in the seventh inning than the eighth inning last year; that’s where he’ll start 2013. Howell was the only reliever the Dodgers signed to a major-league contract this off-season. Lured from Tampa Bay with a one-year, $2.85 million deal, the 28-year-old is a lefty specialist who can pitch up to 70 games or more, one inning or less at a time, when healthy. After not pitching from Sept. 22, 2009 to May 20, 2011 with shoulder injuries, Howell avoided the disabled list entirely in 2012. From 2008-12, he ranked seventh in the American League (min. 200 games) with a .209 opponents’ batting average when healthy. He’s never pitched in the National League before. Howell’s role with the Dodgers is all but assured. Even if he struggles during spring, he’ll probably be given a longer leash than most pitchers on this list. We won’t see much of Elbert during the Cactus League season, if we see him at all. The left-hander had arthroscopic surgery on his left elbow Jan. 23, the same surgery that ended his 2012 season on Sept. 19. He isn’t expected to start throwing until March 6. Opening day is April 1, so don’t be surprised to see Elbert begin the season on the disabled list. If that’s the case, it will open a spot for another reliever to make the opening-day roster — and not necessarily a left-hander, as Elbert isn’t a specialist. There will be a spot in the bullpen waiting for him when he’s healthy. 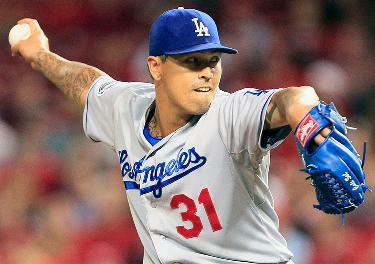 Guerra started 2012 as the Dodgers’ closer. Then the script took a detour. In order: He was hit in the face by a line drive in April, lost his closer’s job in May, missed most of June because of knee surgery, left the team briefly in July when his father had a heart attack, was sent to Triple-A in August, was DL’d with a torn oblique muscle in September and had shoulder surgery in November. Guerra should be fully recovered by the end of spring training, if not the start, but he’ll begin without a clearly defined role. He finished 2012 with a solid 2.60 ERA and 37 strikeouts in 45 innings, though he’ll need to cut down on his walk totals (23) to become a late-game pitcher again. If Elbert misses opening day as expected, Guerra is vying for what should be one of three openings in the bullpen. He’s definitely not the only reliever on the bubble, and starters Chris Capuano, Ted Lilly and Aaron Harang could be in the mix too. It doesn’t help his cause that Guerra has another option year remaining but, with another strong spring, he should be on the good side of the bubble. The Dodgers can’t be feeling great about signing Guerrier to a three-year, $12 million contract in 2010. In year one, he was good enough to make 70 appearances but lost his eighth-inning job to Jansen and Mike MacDougal. In year two, he spent more time on the disabled list (133 games) with tendinitis in his right elbow than on the mound. So what will year three bring? Guerrier needs to stay healthy, for starters. He must also carve out a role for himself in a bullpen where Belisario, Jansen and League get the seventh, eighth and ninth innings. Guerrier is 34 and hasn’t been a multi-inning reliever in years, but his track record in Minnesota and $4.75 million contract for this season mean he’ll be given a chance to find a niche. In the span of the last two seasons, Tolleson laid waste to the minor-league ladder, leaping all the way from low-A to the majors. After making his Dodgers debut on June 7 last year, Tolleson’s first 40 games in a Dodger uniform featured some ups and downs. He was more good than bad in September as his control improved. Still, there was one troubling constant: Tolleson couldn’t retire left-handers, who hit .316/.426/.471 against him for the year. If that trend continues in spring, Tolleson might begin the season in Triple-A. The 25-year-old has a better shot of sticking if Elbert begins the season on the DL; in that case he’ll be pushed by the pitchers listed below, and the Capuano/Lilly/Harang hydra, for the final bullpen spot. It helps that Tolleson can pitch multiple innings out of the bullpen, but so can the three starters. If Don Mattingly is intent on keeping one long reliever/emergency starter type in his bullpen — á la Jamey Wright last year — Tolleson could be at a disadvantage. His future is bright regardless of where he’s pitching Opening Day, but there’s plenty at stake for him this spring. The left-hander began 2012 in college and ended the year in the major leagues, becoming the first player selected in the June draft to make the bigs when he debuted on Sept. 9. Rodriguez gave the Dodgers no reason to send him back to the minors (three hits, one run in 11 appearances). But that was too small a sample size for Ned Colletti to count on the 21-year-old to become the primary left-handed specialist, so he signed Howell. Like Tolleson, if Rodriguez starts the season in Triple-A it’s not an indictment on his potential, and he’ll be back at some point. Drafted as a starting pitcher in 2005, Wall became a full-time reliever in 2011 and reached the majors last season. The 26-year-old proved in seven outings that he’s got a major-league fastball/slider combo, but never really got a chance to stick around. Wall was essentially an injury fill-in. His lot in life didn’t improve in light of the Dodgers’ winter acquisitions, and Wall finds himself in much the same role now. At Triple-A Albuquerque in 2012, Wall saved 28 games. A strong spring will only give the organization more confidence in Wall, and another consistent season closing for the Isotopes will keep him in line for a promotion in case of injury. Withrow is Wall circa 2011 — a tall right-hander drafted as a starter, converted to a reliever, hoping to make the leap to Triple-A while pitching exclusively out of the bullpen. He’s 23 and the Dodgers won’t rush him to the majors. This spring offers Withrow a chance to learn a new role. Ames was drafted as a reliever in 2009, and he’s been a pretty good one in four minor-league seasons. His reward: A promotion to the 40-man roster in November. Assuming Withrow goes to Albuquerque, Ames might just stay at Double-A Chattanooga, where he pitched last season and saved 18 games. He’s at least another year away from pitching his first major-league game but so far, so good. A non-roster invitee, Abreu spent all of 2012 in Triple-A after getting a seven-game cup of coffee with the Astros in 2011. The 27-year-old right-hander was claimed off waivers by the Toronto Blue Jays at midseason and finished 2012 in the Pacific Coast League with the Las Vegas 51s. Abreu signed a minor-league contract with the Dodgers in November. Another NRI, De La Cruz is only 24 but has already had an interesting career. By age 19, he was pitching for the Cleveland Indians’ Double-A affiliate. The left-hander was added to the Indians’ 40-man roster as a 21-year-old two years ago, but never made it past the Double-A level and was designated for assignment twice in 2012. He’s listed as 6-foot-5 and 190 pounds on baseball-reference.com, a rare frame for a southpaw, so you can see where the Dodgers’ intrigue lies. Another NRI on a minor-league contract. Since coming to America from Venezuela in 2006, Infante has pitched in 180 minor-league games and five major-league games — all for the Chicago White Sox in 2010. He’s been a consistent Triple-A relief pitcher the past two years and that’s where he figures to slot in with the Dodgers. The 29-year-old NRI is a veteran of 253 major-league games, all in relief, for the Mariners and Rangers from 2006-12. He’s also a veteran of surgeries on his elbow and back, and fragility seems to be an issue: After pitching a career-high three innings in a game last year for the Rangers, he missed about six weeks with a strained right intercostal muscle. Lowe began his career as a flamethrower capable of touching 100 mph on a radar gun; last spring his fastball was around 92-93, but when healthy he was an effective reliever for all but the final month of last season. The Dodgers signed Lowe to a minor-league contract Friday and invited him to major-league camp to see what he’s got left. Perhaps the most intriguing non-roster invitee, Moylan signed a minor-league deal with the Dodgers coming off back and shoulder surgeries in 2012 that limited him to eight games with the Atlanta Braves. The Australian-born right-hander is capable of pitching 80 games in a season when healthy – he’s done it three times in his career – and he’d love to do it again for the Dodgers at age 34. To do so, he’ll need a strong spring and a little luck. There are plenty of right-handers in camp, but only Guerrier, League and Lowe can match Moylan’s experience. That (and the ability to pitch multiple innings effectively) was an asset for Wright last year when he made the opening-day roster as an NRI. Moylan must show he’s healthy and mechanically sound in order to grab a roster spot. It would be a great story if he does. Palmer had a brief but memorable season for the Angels in 2009, when he went 11-2 in 40 games (13 starts) and even made a couple appearances in the ALCS. The 33-year-old NRI hasn’t been able to replicate that success at the major-league level the last three seasons – or at the Triple-A level for that matter (15-20, 5.73 ERA in the hitter-friendly Pacific Coast League). The Dodgers will see what’s left in Palmer’s right arm, and perhaps give him a spot in the rotation at Albuquerque. This entry was posted in JP on the Dodgers and tagged Brandon League, Chris Withrow, Greg Infante, J.P. Howell, Javy Guerra, Josh Wall, Juan Abreu, Kelvin De La Cruz, Kenley Jansen, Mark Lowe, Matt Guerrier, Matt Palmer, Paco Rodriguez, Peter Moylan, Ronald Belisario, Scott Elbert, Shawn Tolleson, Steven Ames by J.P. Hoornstra. Bookmark the permalink.